Roundup is the most commonly used pesticide in the world and has been in use since the 1970s. Recent documentation has surfaced, however, that shows Monsanto was aware of a link between the active chemical in Roundup and the development of non-Hodgkin lymphoma and other forms of cancer. A lawsuit has been filed which alleges Monsanto went to great lengths to cover this information up, including the use of fake data and marketing the product as safe to eat. Plaintiffs claim that Monsanto’s actions constitute fraud, negligence and the deception of the public for over thirty years despite knowing of the cancer link. 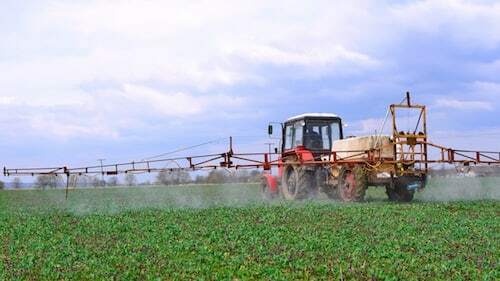 Rosenfeld Injury Lawyers LLC is now evaluating cases on behalf of people who have developed cancers, including lymphatic cancer, after repeated exposure to Roundup Weed Killer. If you or a loved one has been diagnosed with this condition, we invite you to contact our office for a free case review. Roundup is commonly used to treat GMO crops that have developed a resistance to its main ingredient— glyphosate. It is also used in treatments to eliminate weeds and unsightly plant pests on lawns, golf courses, parks and sidewalks. In 2015 alone, Monsanto made over $4.8 billion off the sale of Roundup products. These products go by numerous names, which include: PowerMAX, PRO, ProDry, PROMAX, QuikPRO, Ultra, WeatherMAX, UltraMAX, AquaMaster and RT Master II. Monsanto also markets seeds that have been modified specifically to resist these pesticides and obtains the majority of its sales from the agricultural industry. Who is Most at Risk Due to Roundup Exposure? The people who are most likely to suffer complications due to exposure are those who work in the agricultural industry, landscapers, gardeners or nursery workers. Exposure to glyphosate can cause the development of non-Hodgkin lymphoma, leukemia, B-cell lymphoma or multiple myeloma. There are over 70,000 people in the United States who are diagnosed with non-Hodgkin’s lymphoma alone. Symptoms of this condition include the following. A continuous low-grade fever accompanied by night sweats. Stomach or chest pain accompanied by loss of appetite or nausea. 90% of the cases reported are of B-cell lymphoma while the other 10% are split between T-cell and NK-cell lymphoma. In order to treat these cancers, patients must undergo extensive chemotherapy, radiation, a stem cell transplant procedure and biological therapy. These forms of treatment are often expensive and come with a degree of risk and uncertainty. A US EPA report discovered significant evidence that there was a link between Roundup and cancer in a number of animals. The findings also showed that glyphosate caused damage to human chromosomes within the cells and to the DNA itself. Despite these findings, Monsanto has provided false statements to the government, farmers and the public that claim their products are “as safe as table salt” and can be consumed outright without any risk. While the World Health Organization has concluded that the substance is a carcinogen, Monsanto has not issued any recalls of the products. Litigation against Monsanto is still in its early stages at this point and no settlements have been offered just yet. The potential link to cancer has resulted in a number of victims coming forward who claim that the chemical was the cause of their injuries or the death of their loved ones. As the first cases make it to trial, we will begin to learn more about how your own case may be impacted in this growing mass tort. Contact us today to learn how our Roundup liability attorneys can help you. Rosenfeld Injury Lawyers LLC is a leading prosecutor of claims on behalf of those who have been injured due to the negligent and reckless behavior of corporations that place profit over people. We’ve assisted thousands of clients in recovering the compensation they deserved and are prepared to fight diligently on your behalf. What types of cases are considered to be personal injury law? Can I handle my own personal injury case?